The Jeju Aerospace Museum (JAM) is located in the southwest corner of Jeju. According to the, “JAM is the biggest space-science museum in Asia”. Yunwoo Na and Jino Yun, two other children loved their model airplane kits. Boran Lee, a JAM employee, said, “My favorite part in JAM is Orion. Orion is the name of a 3D simulator. Since my job is to collect and check the tickets of 5D cinema, I also like the 5D too. 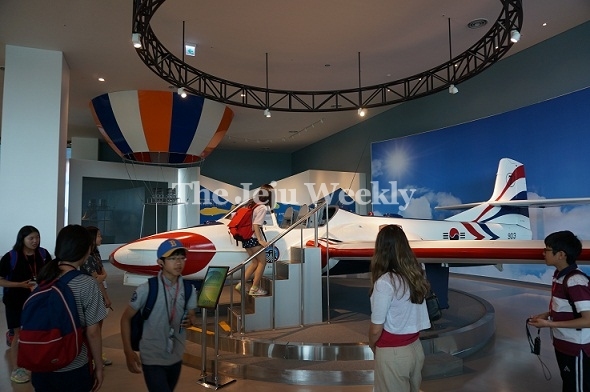 Jeju Aerospace Museum is a good place for everyone. Adults can see some amazing planes and jets, and children can learn about the space. This should help students bolster their science grades.